In G series, Motorola has introduced Moto G5 plus in the metal body design. Moto G5 Plus features a 5.2 inch display with Full HD resolution (1920 x 1080 Pixels) and 424 ppi pixel density. It runs on Android Nougat 7.0 with Motorola’s software. Finally, the most awaited, Moto G5 & Moto G5 Plus launched today in India. Both the phones were showcased in Mobile World Congress held in Barcelona, Spain. From that time, Moto Fans in India start Waiting for the Moto G5 & G5 Plus launch in India. But today, the wait is finally over and Moto G5 Plus launched today in an event. Moto G5 Plus has an amazing specs sheet which includes the Snapdragon 625 Octa Core Processor and comes with 4GB RAM and 32GB Internal Storage which can be expandable up to 128 GB using MicroSD card. Moto G5 runs on Android Nougat out of the box and also has Google Assistant. Moto G5 Plus also comes with Moto Action and Moto Display which gives you additional gesture controls like Chop Chop for turning On/Off Flashlight and twisting to open the camera. This time, Moto G series also get the NFC that means Moto G5 & G5 Plus are ready for Android Pay when it comes to India. Moto G5 & G5 Plus has 5.2′ Full HD Display which is a perfect display size for entertainment as well as for normal usage. The Display is protected by Gorilla Glass 3 which is also a Water repellent. The entire body of Moto G5 Plus is made up of High-Grade Aluminium and the phone is just 7MM thin. With the Metal unibody, Moto G5 Plus indeed gets the premium look in a mid-range price. The phones support dual SIM and 4G VOLTE and there is No Hybrid Slot. Moto G has all new fingerprint sensor at the front and which can also be used as Navigation touch bar to go back and forward. Moto G5 has a powerhouse of 3000mAh battery which also supports turbo charging. 15 Minutes of charging can give you a battery backup of 6 hours which is quite impressive. Moto G5 has 13 MP f/2.0 camera sensor and has a 5MP front facing the camera. While Moto G5 Plus comes with 12 MP f/1.7 Rear Camera Sensor which comes with Dual Auto Focus Pixel and also capable of shooting 4K videos which are great camera specs considering the price. Moto G5 Plus has 5MP Wide Angle rear camera for more wider group selfies. All the great specs packed in the high-grade aluminum body comes with a great price tag. Moto G5 Plus comes in two variants and price starts from ₹14,999 (3GB + 16GB) and ₹16,999 (4GB+32GB). Moto G5 Plus available in two colors that is Fine Gold and Lunar Grey. Moto G5 Plus would be available exclusively on Flipkart. Flipkart and Moto are providing additional launch offer to their customers. Flipkart is giving an additional ₹1,500 off on exchange and an extra 10% discount on SBI cards. Additionally, users can get Moto Pulse 2 at Rs 599. 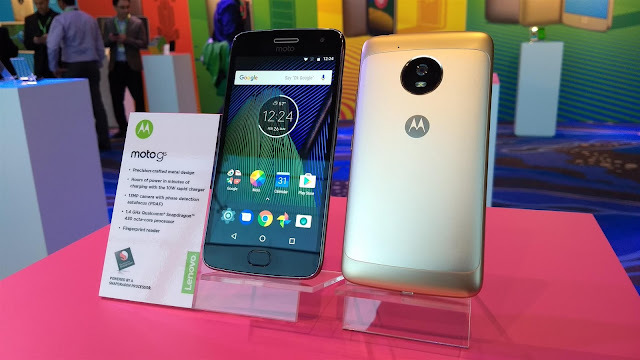 Flipkart is also unveiled BuyBack Guarantee Scheme with Moto G5 Plus under which Flipkart assures that Flipkart will buy the Moto G5 Plus at an assured price whenever customer purchases next phone from Flipkart. But, customer have to buy next phone within 6 to 8 months.